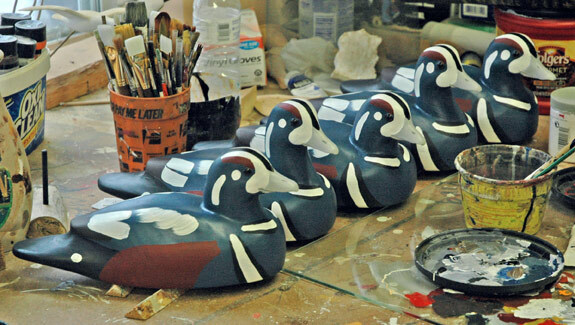 These cedar Harlequin decoys were made from our pattern. This section of our site is for those of you who are carvers or who would like to become carvers. In it you will find tools and patterns, decoy kits and the book Basic Decoy Carving that ties it all together and even provides information on suppliers. The second change is that we are dispensing with cork decoys. It's not that they haven't been popular–quite the contrary. The problem is that our longtime supplier is gone and the one taking over saw fit to increase the price of the cork by more than 40%. Since that would necessitate a heavy increase in the pricetag on our cork decoy kits, we will be changing over to cedar bodies.